Outdoor Facilities: Outdoor Pool, Terrace, Parking, Barbeque Facilities. Free Services: Free WiFi, Free Parking, Free Beach Chairs, snorkeling gear, beach towels. You’ll find the three-star Boardwalk Small Hotel just 200 meters from the well-known Palm Beach. 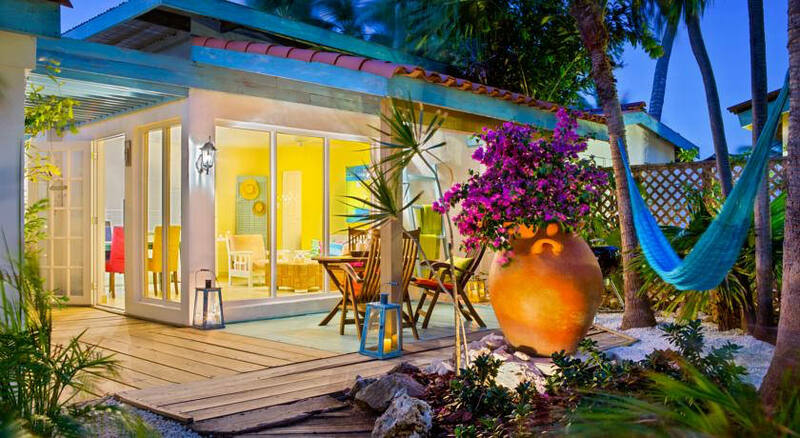 The family-run hotel has recently been renovated, and all casitas (small houses) have been refurbished giving them a typical island style with bright Caribbean colors that contrast beautifully with the blue Aruban skies. Wifi and parking are free. Snorkelling equipment can be borrowed from the hotel, to be used at the nearby Arashi beach – a perfect spot for admiring some tropical fish. Outdoor facilities include a BBQ, outdoor pool, a garden and terrace. Families with children are welcome, children under 12 years can stay free of charge when existing beds will be used. In early 2017, the Boardwalk Hotel Aruba opened a dedicated beach area on a quiet part of Palm Beach. The new beach club is located right across the street from the hotel, near the Ritz-Carlton Aruba Resort. Beach services now include the complimentary use of palapas (beach huts), from where you can order food and beverages. Your orders will be taken care of by the staff of the Ritz-Carlton, and delivered straight to your beach hut or beach chair by Segway! Comfortable lounge chairs and showers are also available for hotel guests. At the Vela watersport center, also located on Palm Beach, hotel guests can enjoy an exclusive 20% discount on several services, safety lockers and rental of equipment for all kinds of water activities.